Most people associate Saratoga Springs with horse racing, summer concerts at SPAC, or the bustling downtown with its many pedestrians, shops, and eateries. 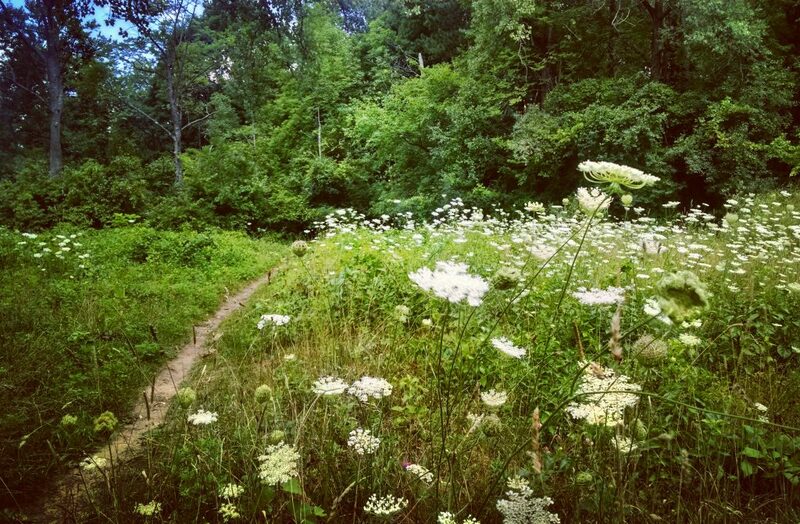 But, you don’t have to leave the city to find a piece of nature and hit the trails. 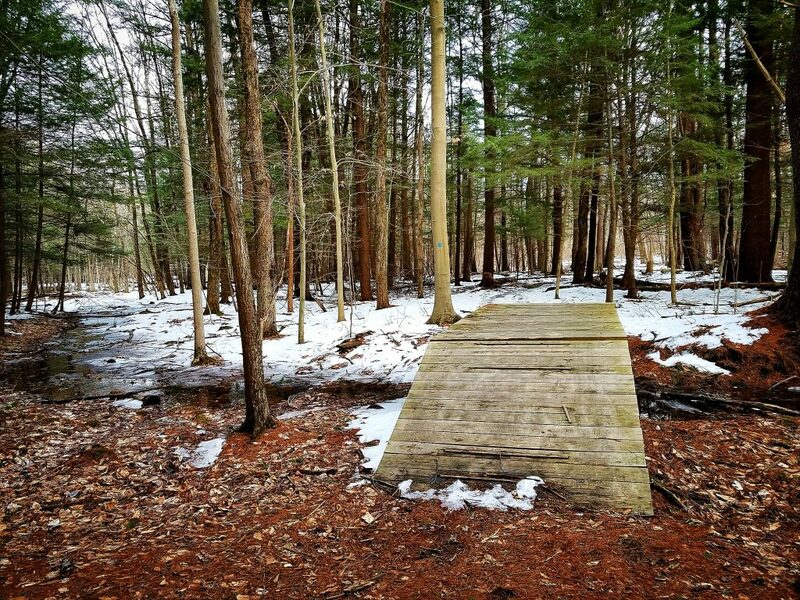 The Saratoga area is home to a myriad of off-pavement routes with varying terrain and scenery, offering excellent trail running for beginners, more advanced folks looking for a technical challenge, and everyone in between. As you’re already in the city, you can grab some hard-earned food or drink downtown or on picturesque Saratoga Lake after your run! Beforehand, stop by the EMS in Wilton to make sure you have everything you need! Trailhead Parking: Plenty. You can easily access trails from almost anywhere in the park. The Spa State Park may seem like an obvious place to enjoy the outdoors, but hidden beyond the towering pines are miles of dirt trails. 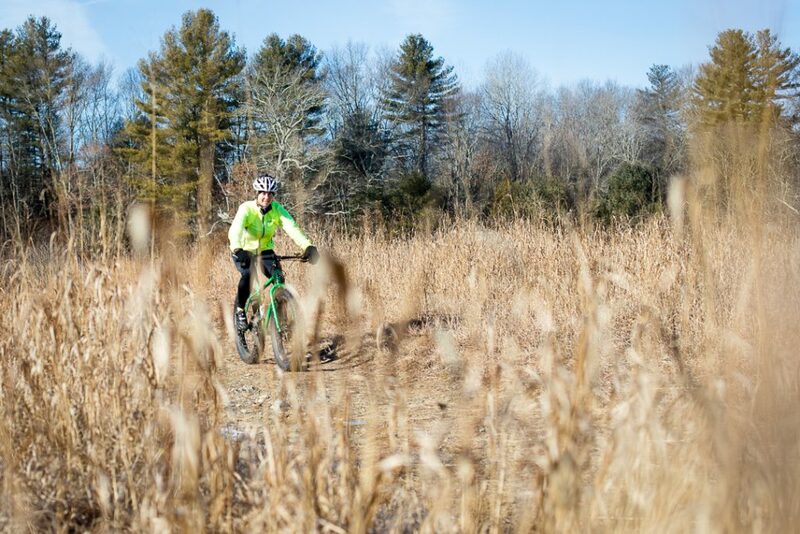 With numerous trails, paths, and park roads, there’s something for everyone. As such, you can “choose your own adventure” based on your experience, mood, or the trail conditions. The Five Mile Trail, designated by yellow markers, is a dirt loop with a few paved sections that doubles as an excellent tour of the park. You’ll often be in woods but also see the areas of the park that attract its many visitors: a natural geyser, mineral springs, the historic Hall of Springs, Geyser Creek, wetlands, and the reflecting pool, to name a few. For beginners or those who haven’t hit the trails in a while, the park is an ideal place to visit. Particularly, it offers many paved trails and roads providing options for shortening your route. Thus, it’s easy to jump off the trails if you need a break or if you encounter less-than-ideal conditions, such as ice or mud. 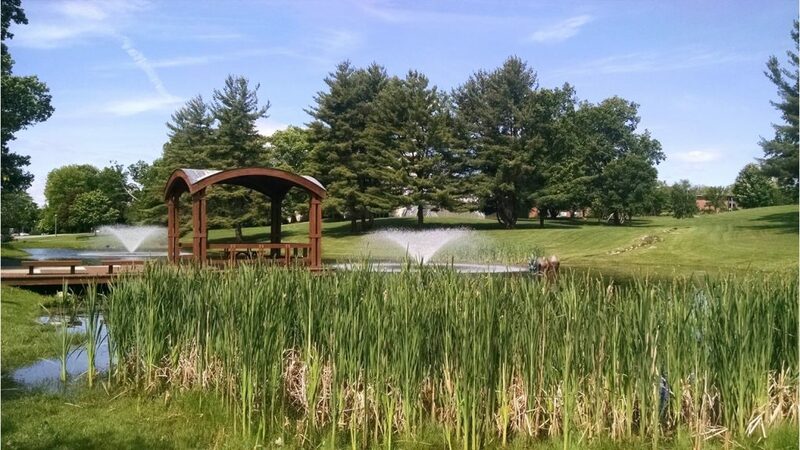 Bonus: Bathrooms (open in late spring through early fall) are present at the many picnic pavilions scattered throughout and have a few spigots to fill up your water supply. Make sure, however, it’s a spring and not a mineral water location. Recommended Run: Combine these areas for a longer route. Trailhead Parking: Designated dirt area off Crescent Avenue for the Hemlock Trail and a paved parking lot off Crescent Street for the Karner Blue Butterfly Area. Although technically part of Saratoga Spa State Park (view a map), both of these routes are slightly removed from the main area, providing a more secluded experience. As a result, they’re a great place to escape when SPAC has a major concert or event and also offer unique biodiversity worth exploring. The Hemlock area offers two trails, denoted by blue and green markers. While the former is easy to follow with four bridges traversing wet areas, the latter is less traveled and can become overgrown, so beware if you’re wearing shorts. 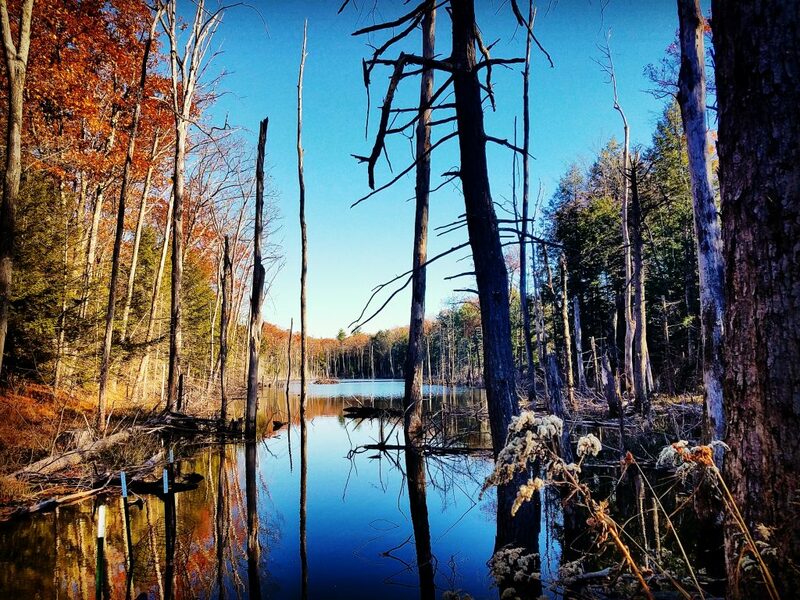 As well, the Hemlock area is home to forested wetlands and the most expansive area of native forest in the State Park. Around you, you’ll see old-growth hemlock and rare perched swamp white oak trees. To extend your time outdoors, combine either of these with the Karner Blue Butterfly Area trails. Keep your eyes peeled for wild blue lupine and the endangered Karner blue butterfly, as the area recently underwent habitat restoration to help preserve the species. Aside from stumbling across the occasional exposed tree root, you’ll find that sandy soils mostly comprise this path. Here, they’re needed for the butterfly habitat and also make for a cushy run. This area is popular with mountain bikers and is ideal for anyone looking for a fun and technically challenging trail run. Due to the rugged terrain, extensive trail system, and shared use, however, this route is recommended for intermediate to advanced trail runners who are comfortable on varied surfaces and have decent wayfinding skills. The Carriage Road loop, which begins from the parking area, is wide, well-established, and easy to follow, albeit often rocky. Use it to get your feet wet (literally) and access the many other trails, like Bee. Bee is an enjoyable route that will have you feeling like a mountain goat while zigzagging up and over large rock outcrops, around trees, and over roots. Bee ends at a junction with the Main Trail (denoted by red markers). From here, take a right (north) to access more winding trails, such as Ridgeline or Here to There. Or, take a left (south) to get back to the Carriage Road, and you’ll get treated to a pleasant view of a calm, swamp-like pond. 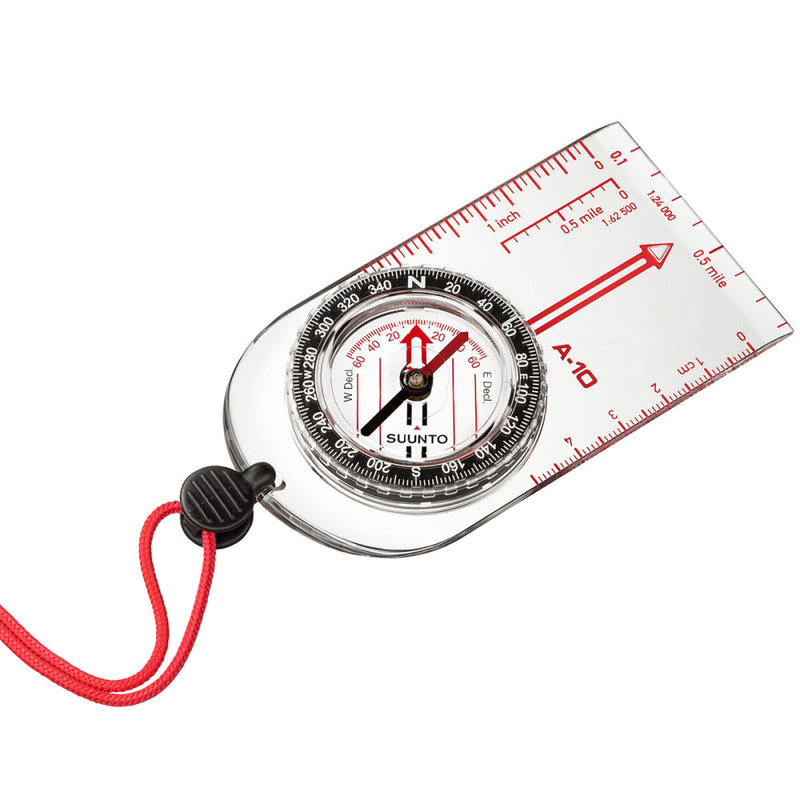 Because the trails can be hard to follow in certain areas, carrying a map is highly recommended. Also, since you may encounter mountain bikers and narrow passages, be sure to stay alert while running here. 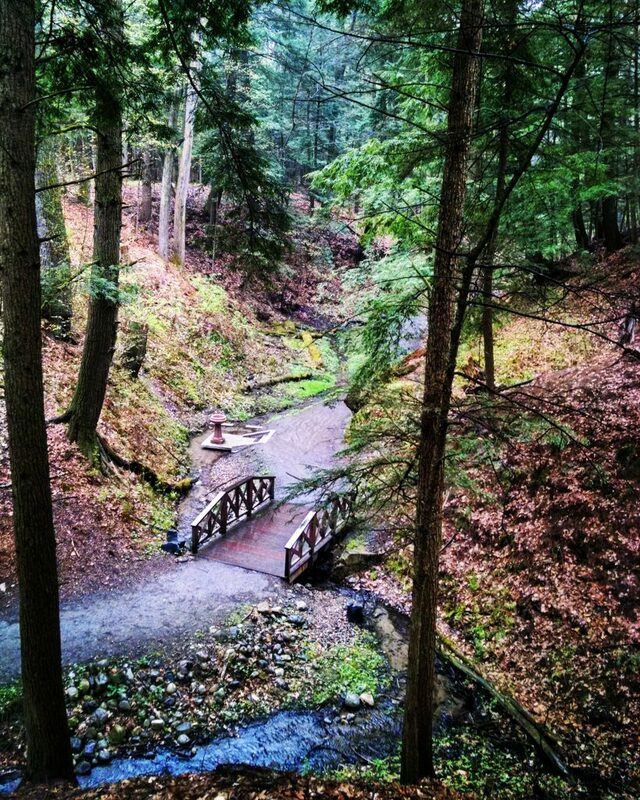 Skidmore College, a small private liberal arts school, is just a mile north of downtown Saratoga and maintains 150 acres of ecologically interesting woods. The North Woods are home to unique flora and fauna, and the school offers over 30 college courses related to them. For trail running, red, blue, or orange markers indicate primary routes and a handful of connector trails. Thanks to the North Woods’ steward program, these are well marked and maintained, although some can be quite rocky and root covered. In recent years, boardwalks have also been installed over chronically wet areas. As you move along, you’ll find a few moderate-to-steep hills that really get your heart pumping, and a small stream provides an attractive area to cool off. If you’re looking to get into more challenging trail running, this is a good place to start. Compared to the State Park, the terrain here is more technical. But, the trails are wide and relatively short and feature stretches of easier ground and boardwalks. Recommended Run: All of the trails! Get close to the lake on the red trail or overlook it from higher ground on a yellow trail. Woods Hollow Nature Preserve is a wonderful hidden gem. Although it’s well trafficked, most likely haven’t heard of it. Once you’re here, you’ll find wide, well-maintained primary trails based on old logging roads and narrower, more technical secondary loops. Out of both possibilities, the latter provides beginners and more advanced trail runners with appropriate ground. As you go farther, you’ll come across a small, picturesque lake in the heart of the preserve that is a popular summertime fishing spot. Additionally adding to the diverse landscape are a smaller pond, meadows, lupine fields, a sand pit, wetlands, and new- and old-growth pines. 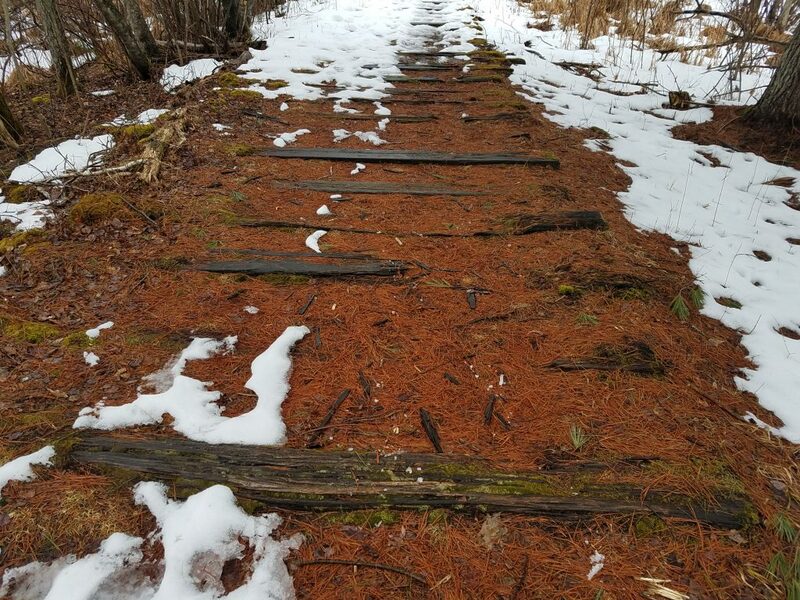 The Bog Meadow Brook Nature Trail is a straightforward, two-mile route that runs along an abandoned railroad line. Given its linear design and long line of sight, the trail is easy to follow and offers many opportunities to take in the natural surroundings and let your mind wander. The route includes just one intersection, a clearly labeled spur that climbs 0.2 miles steeply up to an adjacent residential neighborhood. As the trail traverses three distinct wetland systems, there’s much to observe, including an abundance of wild and plant life. To do so, various benches, interpretive signage, and handful of viewing platforms let you sit back and watch. 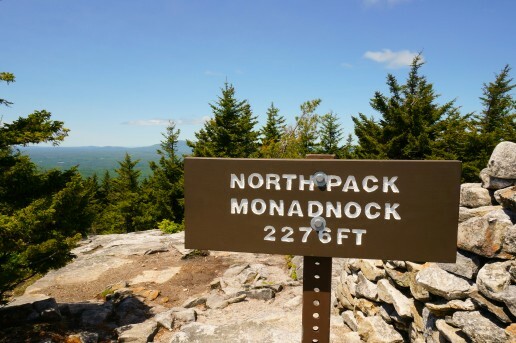 Named for the mountains marking the beginning and end—Mount Watatic in Ashburnham, Massachusetts, and North Pack Monadnock in Greenfield, New Hampshire—the 21.5-mile Wapack Trail opened in 1923, making it one of the United States’ oldest interstate trails. Crossing both public and private lands, the Wapack of today is virtually unchanged, except for some re-routing to adapt to changing conditions. 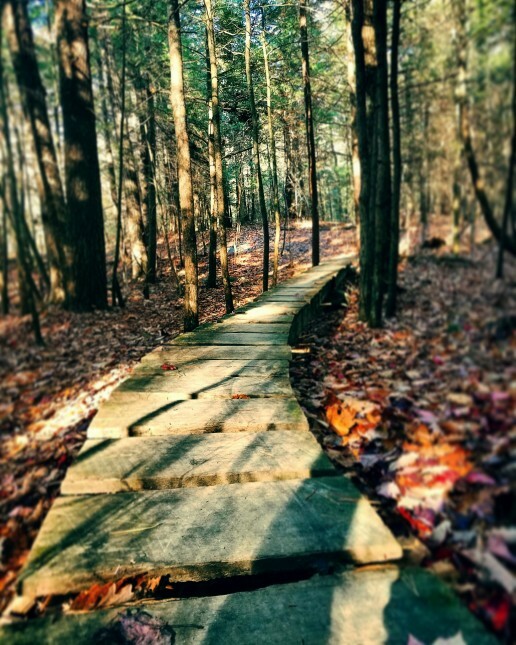 Whether you’re looking to attempt the entire trail in a day or run it in sections, the Wapack has something for everyone. At the same time, it goes through the traditional New England landscape, cresting rocky ridges and descending past dark forests. If, however, you just want to sample the choicest parts, here are some of the Wapack’s must-do runs. Miller State Park, located off Route 101 in Peterborough, New Hampshire, is home to Pack Monadnock (or, simply, “Pack”), which is one of my favorite portions along the Wapack. In fact, you can tell how great this run is because, despite its many negatives, I find myself there on a weekly, sometimes daily, basis. Honestly, this run is so good I routinely have to force myself to go other places at lunch. It may be a paradox, but the bad thing about this trail is that it’s so great. It has interesting terrain, it’s short enough that it attracts people of all fitness levels, it’s steep but not so much that it can’t be run, and it offers amazing views. However, because it’s such a great trail, it’s also quite popular, which means it also has a parking fee, a heavily traveled road, and a bunch of buildings on it. Pack’s positives far outweigh its negatives, though. For example, the bathrooms at both ends can be a welcome sight, and the running water at the summit means there’s no need to carry bottles or hydration bladders. 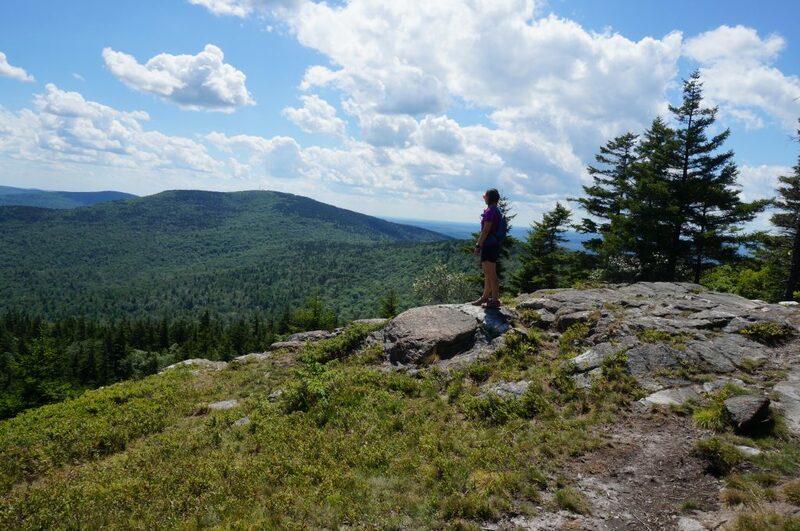 Leaving the Miller State Park parking lot, the Wapack Trail climbs 1.3 miles while gaining a little under 1,000 feet to the 2,290-foot summit of Pack Monadnock. Feeling winded? Don’t let the steep and challenging nature of the trail scare you off. The first quarter-mile is the hardest. After that, the trail flattens out and becomes less technical, at least by New England standards. 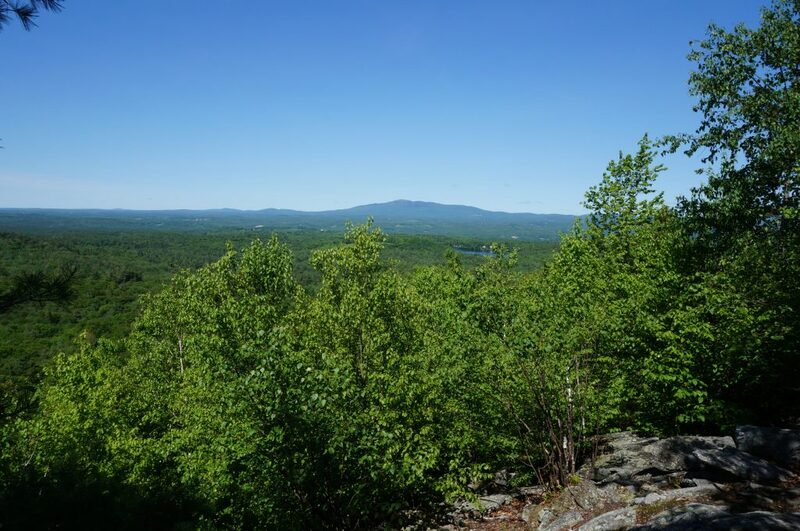 If the initial climb hasn’t left you too blurry eyed, look out when the forest opens up and take in the awesome view of Temple Mountain and Mount Monadnock as you cross the breaks. While not technically on the Wapack Trail, a few variations let you add mileage, increase difficulty, and take in more stunning views. 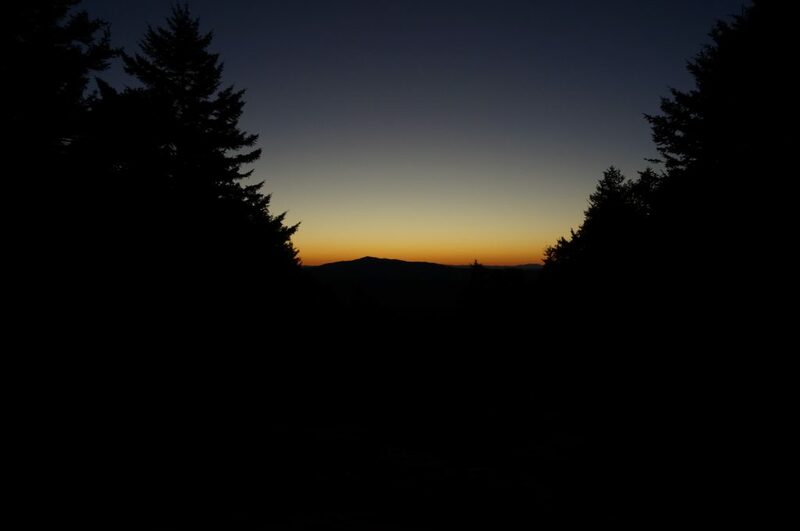 The most natural thing to do is create a loop by descending the Marion Davis Trail from Pack Monadnock’s summit. Roughly the same length as the Wapack Trail, the Marion Davis Trail is a little less steep and technical, making it a much easier descent on tired legs. There are plenty of occasions when I want to run Pack Monadnock but need or want to run farther than three miles. 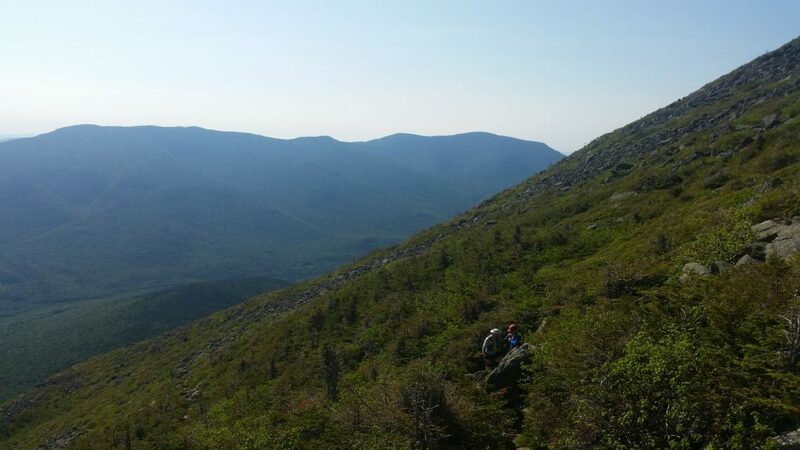 In these situations, traveling over to the summit of 2,276-foot North Pack Monadnock (or just “North Pack”) is the perfect solution. When I stand on Pack’s summit, North Pack looks only minutes away, but in reality, it’s a fun two-mile run across a wooded ridge. Not very technical, and with the exception of a few steep parts at the beginning and end, this section is perfect for picking up the pace, at least if you have the legs to do it after ascending Pack. In the fall, leave the energy bars at home, as wild blueberry bushes are abundant around the summit. Looking to add even more challenges or cover different terrain? 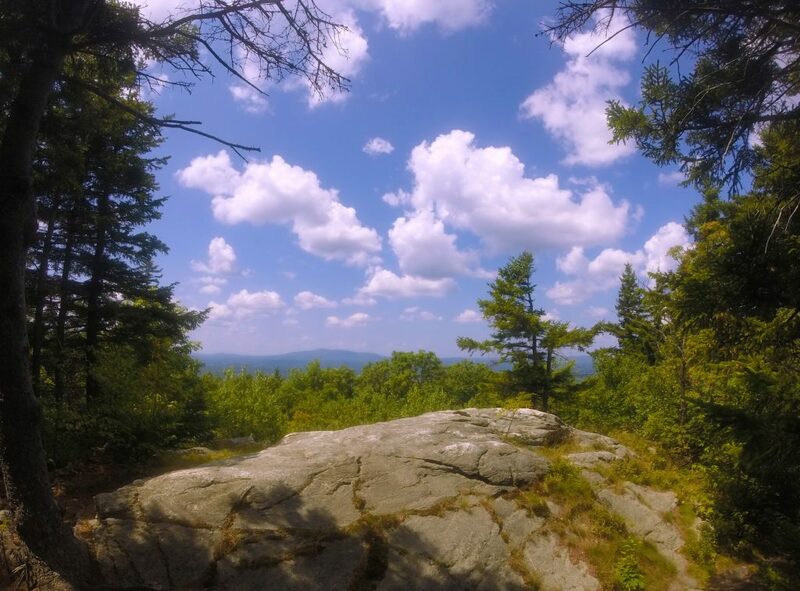 Divert from the Wapack to the Cliff Trail to add an extra half-mile as well as some trickier conditions on your way to North Pack’s summit, and then, on the way down, follow the Wapack Trail back to Pack (and, eventually, to your car). Marking the trail’s southern terminus is 1,832-foot high Mount Watatic. 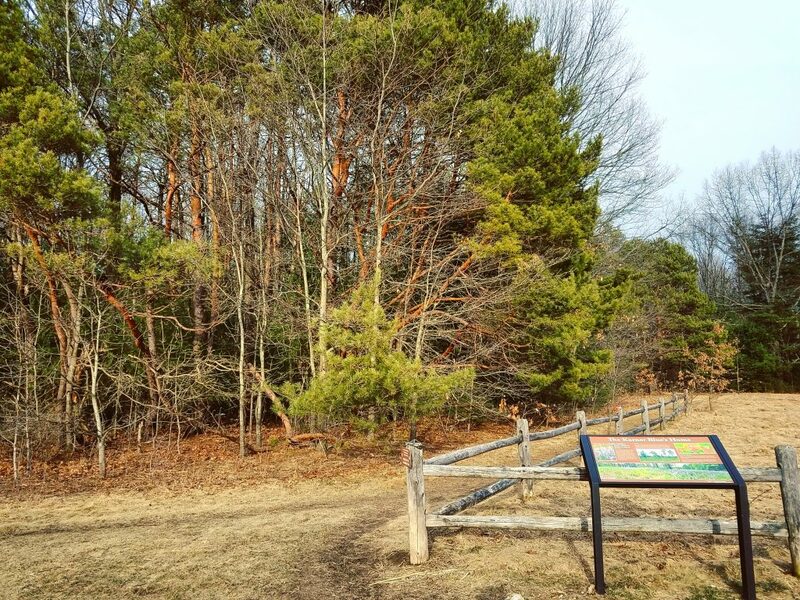 Here, the Wapack Trail leaves from a well-marked parking lot off Route 119 in Ashburnham, Massachusetts, and on busy weekends, you’re likely to see cars lining the road, as the lot reaches capacity quickly. 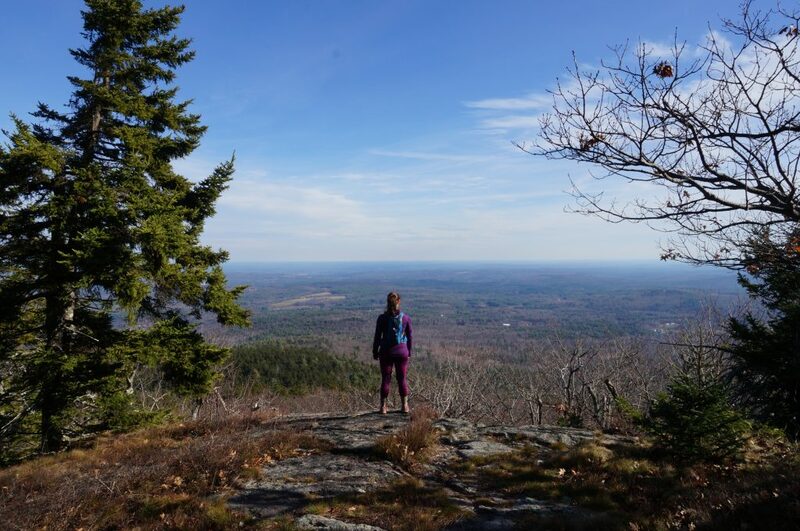 Mountain runners will love running the Wapack Trail on Mount Watatic, as it packs plenty of vertical, crosses diverse, demanding terrain, and features a bald summit with incredible views of Mount Wachusett. On clear days, even the Boston skyline is visible! What’s truly impressive is that it does this all in just a little over a mile. Looking for an additional challenge? Just do what the runners of the Wapack and Back (the double-length trail race along the Wapack) do when they reach Watatic’s parking lot in order to hit the 50-mile mark—run up it, over it, and back a second time. It’s believed that the Native Americans named these mountains, and that “Pack” means little. 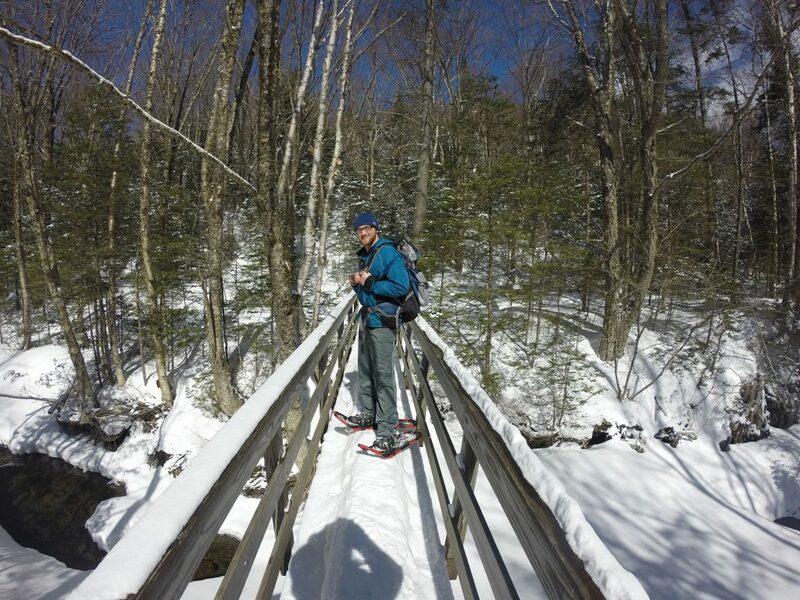 While they may be small in stature compared to some of New Hampshire’s larger mountains, the Wapack is capable of delivering big days. For those looking for a full-sized outing, running the Wapack from beginning to end is a worthy challenge. But, don’t make the same mistake I did: Take the trail seriously. 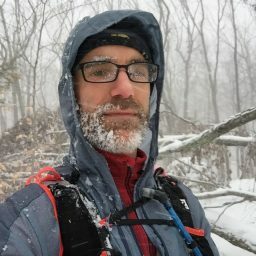 Running the Wapack is no joke, with technical terrain and fickle New England weather—wet and slippery in the spring, hot and humid in the summer, leaves covering obstacles in the fall, and snow and ice in winter—thrown in. And, it’s not just the nature of the trails and the weather that make this climb difficult. Additionally, the route ascends approximately 4,600 feet over its 21.5 miles, and with numerous short and steep up-and-downs, its relentless nature can exhaust even the heartiest trail runner. While signing up for the Wapack and Back race is one approach, running the Wapack Trail self-supported is a fairly easy undertaking. 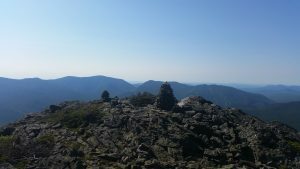 First, the Wapack is very well marked, with yellow blazes and cairns on the ridges; in most instances, just a quick look around will reveal one. Secondly, the trail passes plenty of places to stash extra food and water. Or, because of some sections’ easier nature, you can have people of all skill and fitness levels meet you along the way with something to eat or drink or maybe even give you that much-needed pep talk. With the exception of going through the whole thing, I have only highlighted runs at this awesome trail’s beginning and end, and there are so many other good routes in between. Get out to explore this historic trail, find your new favorite run, and maybe even challenge yourself to do it all, whether in sections or all at once. Nichole Danis is crushing motherhood, the weekday grind, and every moment in between. The 41-year-old grew up in Plainfield, Conn., and now calls Canterbury home with her husband, two beautiful daughters (who will also be crushing it, sooner than later), two dogs, chickens, and a bunny to boot! 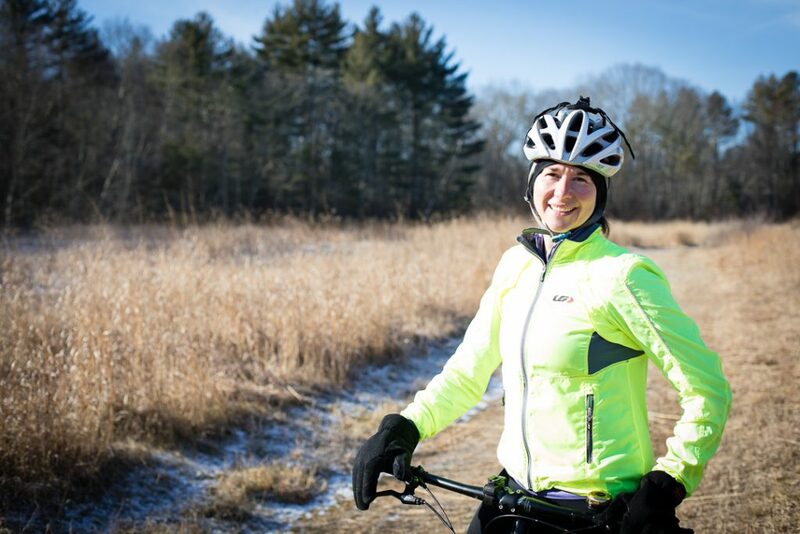 Nichole and her family absolutely love the outdoors, staying active and getting the most out of every day. goEast: Who gave you the “bug” for being active outside? 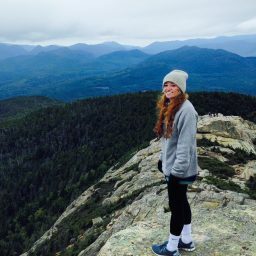 Nichole: Would have to say that my love of the outdoors comes from my dad. As a child, my father was always involved in outdoor activities. I enjoyed seeing him excel in the sports he played, but I think the camaraderie with his friends was what I remember most. Besides playing softball, he also was an avid golfer, hunter, [and] fisherman and enjoys hiking. Today, he is in his 60s and still lives an active lifestyle. goEast: You don’t have the average job. Your daughters are equally passionate about living an active life, and your husband is just as driven. Can you tell us a little bit about finding time between work, family, and personal fitness goals? Nichole: Well, I just celebrated my 15-year anniversary at Pfizer Pharmaceutical, where I’m a working supervisor in a high-output histology laboratory. It’s true: I have two very active daughters. Leah is 10 years old and participates in karate. Avery is 8 years old and plays soccer. They each participate typically twice a week. On top of their sports, they are also both involved in a local theater club. My husband Matt and I have been happily married for 15 years. He is an avid cyclist. If he’s not on his bike in his spare time, then he is tinkering with them! 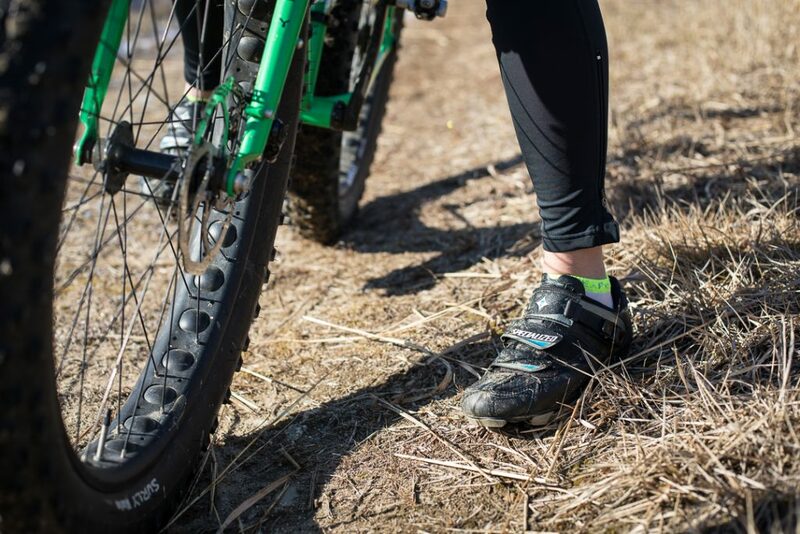 If I am not at work or running my children to their activities, then you can usually find me tying up my laces for a run, jumping on my fat bike, or in the pool for a swim. “Free time” is not a word we use a lot around our house! We are always in motion. I find it very important to make time for the things that make you feel good. I’m up at 4 a.m. each morning, put in an eight-hour day at work, and then squeeze in whatever exercise I can for myself. Getting regular exercise is really important for me, so each year, I like to set a goal for myself. The goals over the past few years have been quite challenging, but [I am] extremely grateful to have a family who recognize just how important it is to me. They are my biggest cheerleaders! 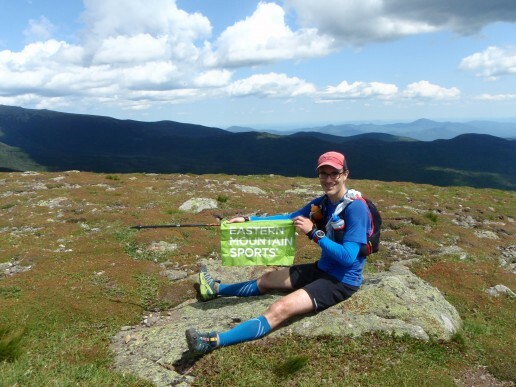 Recent events I’ve completed include the Olympic Distance Triathlon, Half Ironman Triathlon, [and] Vermont 50 trail run, and last year, I biked up Mount Washington in the Mount Washington Auto Road Hillclimb. There are days when it is really challenging to train, or simply doesn’t fit in, but setting goals makes me get out. It becomes something that I almost have to do, and I secretly like having that pressure to get it done! goEast: While you’re crushing it across all points of interest here, can we also add you’re crushing the textbooks? Nichole: Ha ha, yes, I’m pursuing a master’s degree in public health with a focus in nutrition. Thankfully, I can do this online! Might be a good time to talk about nutrition, which truly is a passion of mine! In the past, I would beat myself up a bit: “I’m not fast enough, strong enough, or have the energy I used to have; if I were only five pounds thinner,” etc. These are the things that would actually cross my mind! I have decided to let all of that go. Today, I focus on being healthy, happy, and want to be a positive role model for my girls. So, my kids make fun of me for drinking protein shakes and eating salads, but that’s okay. Nutrition plays a huge role in how you feel and perform. I’ve learned my lesson the hard way! These days, I tend to eat a mainly plant-based diet; however, I incorporate lean proteins, such as chicken, fish, and beans. When I’m on the run, I’ll quickly throw together a shake. My favorite is chocolate protein powder, coconut water, [and] a tablespoon of peanut butter with a frozen banana. Yum! When out for a long ride or run, I choose Shot Bloks. They tend to be quick and easy to grab from a jersey pocket. goEast: We’ve covered a lot of ground here, but one cannot “go east” without touching on the gear you cannot live without! Can you share, say, your three must-haves? Nichole: Three items I just can’t live without…When I think about this question, the first thing that comes to mind is my winter wear! It doesn’t matter how cold it is, as long as you have the right gear. I have a heavy pair of tights that I wear for both running and riding. Another important item would be a reflective vest or coat (safety first! ), and lastly, I need ear coverage. I’ve had the same two EMS headbands for close to 10 years! 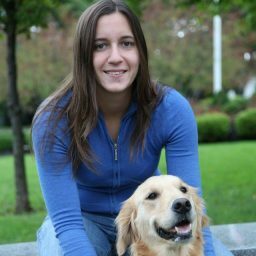 goEast: OK, Nichole, it feels like a fairy tale, from supportive family to an incredible career and even grad school. We know this is just a snapshot, and it’s not always easy. What inspires you to get out of bed at 4 a.m.? Nichole: What inspires me to get out of bed? Honestly, as much as I love being active, I also love the friendships I have through being active. For instance, I have regular running dates with my friend, Nicole. Not only will we get out for eight miles, [but] we will also catch up on all the craziness our lives have brought us that week. Most of my friends whom I exercise with are in the same boat. We are all trying to be good moms, and exercise helps us do just that. Sounds funny, right? I have a feeling that many of you know what I am talking about. Exercise helps us feel better about ourselves. It releases stress and keeps us healthy. It gives us confidence and helps connect us with others who have the same interests. I just won’t spend an hour talking on the phone with friends but schedule some running or biking time, and we will have plenty of time to chat. goEast: To wrap up our time together, do you mind sharing advice on how to stay inspired? Nichole: Do what you love, and love what you do. If you don’t like running, then don’t run. There are so many other options. My knees just can’t handle another full marathon, but that’s okay. I enjoy getting on my bike more and have added more pool time. I guess that would be my advice to other women. Don’t beat yourself up or give up. Do what you like doing and have fun! The average American consumes somewhere between 2,000 and 2,500 calories every regular day. But, on Thanksgiving Day? That’s a different story. Turkey, stuffing, mashed potatoes, carrots, and more, all doused in a puddle of gravy, balloon the typical caloric intake to more than 4,500 on the holiday alone. Mount Isolation’s name speaks for itself, with 14.6 miles round-trip and no views until the summit, but a nine-hour trek in snowshoes, the day after a dumping, would just about compensate for a Thanksgiving filling, and you can cross it off your list of 48! Don’t forget your snowshoes and your cold-weather gear! A full meal calls for a full day of biking, and this 150-mile route is at least a simple, if not easy, way to burn off your dinner. 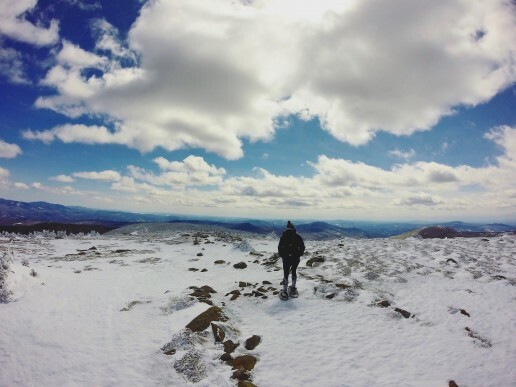 Start your route at the Institute of Contemporary Art in Boston, follow through Boston and into New Hampshire through various little towns, and finish at the base of the White Mountains in North Conway. 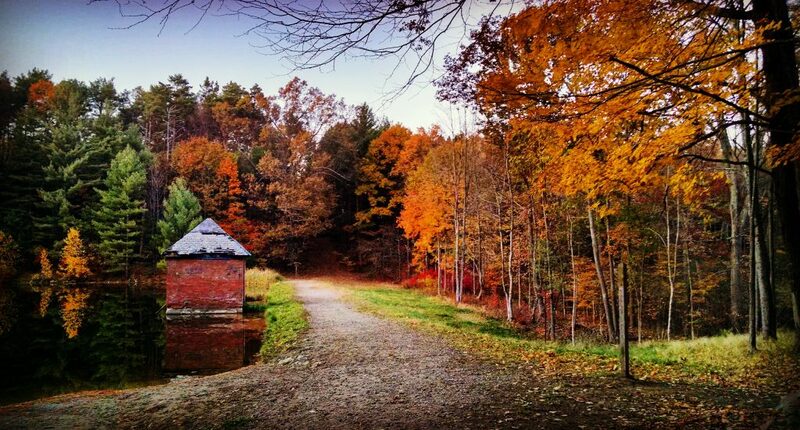 This scenic route will leave you tired, but fully relieved of everything you ate. All the way up, and all the way down, for 13 straight hours. 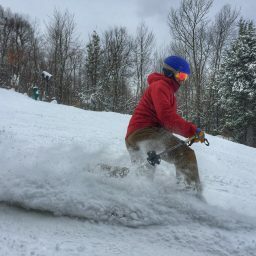 Thousands travel to New Hampshire to break in ski season and head down the ravine, but you’ll have to work a little harder post-Thanksgiving. 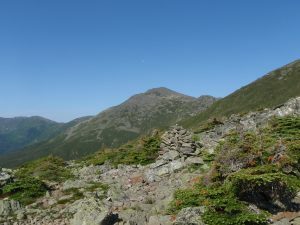 Start your hike at Pinkham Notch off of Route 16 and take the Tuckerman’s Ravine Trail 3.6 miles until you reach the top of the bowl. Climb up, drop in, and then take the Sherburne Ski Trail, before you ski back down to the parking lot. For this to really burn off everything you consumed, you’ll have to repeat this path around three or four times, for a total of 13 hours of skinning and descending. Sure, this requires months and months of training, but for burning off all of those calories, this activity is perfect! 50 miles of straight running should about take care of it, but if you have any leftovers to snack on along the way, you might need to add a little extra distance. If you live in an area with a lake frozen over by Thanksgiving, 9.5 hours of skating is always another option! This frozen fun can involve the whole family, as long as the ice is thick enough! If it turns into a hockey game, you’ll be able to drop an hour and a half of ice time. With the family home for the holidays, it can be a great time for game nights! If you’re looking for some friendly competition indoors or out, table tennis for 17 hours straight will burn those calories away! If you’re skilled enough to rally the ball the entire time, you could even set a world record! Although some of these activities are out of reach for the average person, it’s always important to be aware of what goes into your body, and how you can stay healthy. Have a safe and happy holiday, and if you’re out exploring, don’t forget to tag your photos with #goEast for a chance to be featured! How will you be burning off those 4,500 calories? If the thought of winter’s shorter days and freezing temperatures makes you want to grab a fleece blanket and go into hibernation on your couch, you’re not alone. It’s the time of the year when people tend to gain body fat, skip workouts, and just feel generally blah. 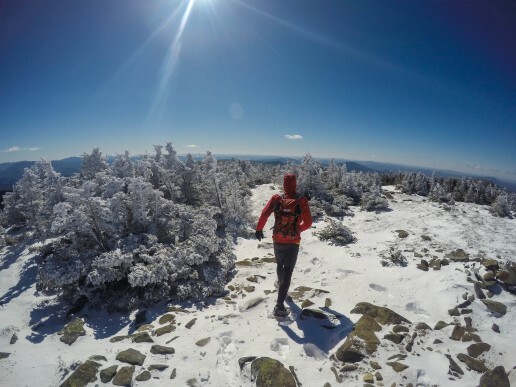 But, if you’re an outdoor athlete or even just a weekend warrior looking to amp up your fitness level, cold-weather workouts provide a ton of benefits and prepare you for your spring and summertime adventures. 1. Cold-weather training is good for you! 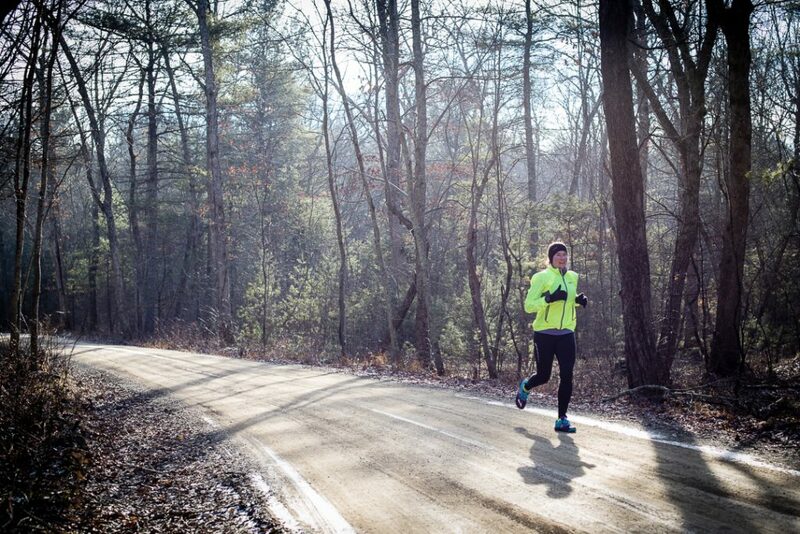 Training in the cold may take an extra bit of motivation, but ultimately, it’s good for you. Specifically, winter’s lack of sunlight means your Vitamin D level decreases, leaving you a bit more lethargic than in the summertime. Going outside and training can combat this: It boosts your levels of serotonin and gets those feel-good endorphins going. What’s more, when you work out in colder temperatures, your body has to spend extra energy in order to stay warm. This fires up your metabolism and burns more calories at the same time. Additionally, this approach taxes your lungs (ever notice that it’s more difficult to breathe? ), which can improve overall athletic performance. Finally, you can’t discount the mental edge you’ll experience. Ever see Rocky IV? To recap, he goes out and runs through the frozen Siberian landscape, where he chops down trees and pulls sleds to get lean and mean for his fight. Why? 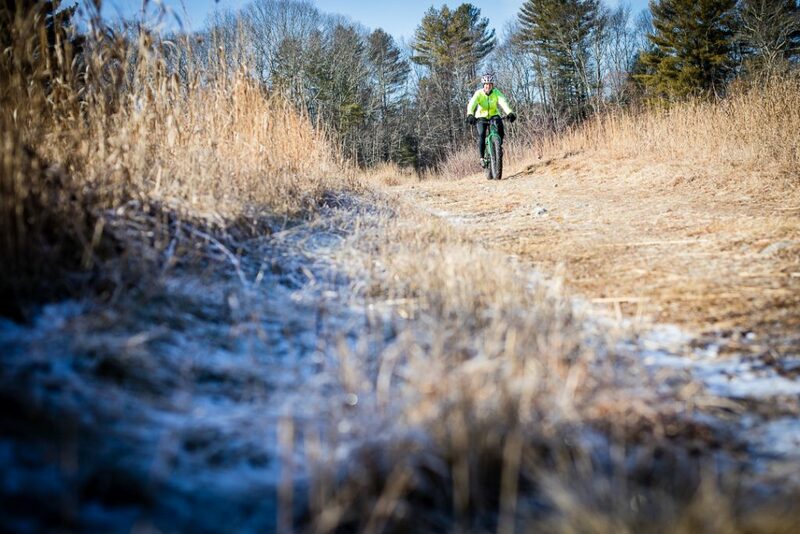 Because physical activity in colder temperatures builds good, old-fashioned grit. Before you step out into sub-freezing temperatures, make sure you’ve layered up properly. Keep in mind that, rather than find yourself shivering, you can always ditch the outer garments if you get too hot. To start, wear a synthetic base layer to wick sweat away, followed by a mid-layer and a windproof outer shell, and you’re good to go. Also, don’t forget to protect your extremities and cover your neck and head, as this is where much of your body’s heat is lost. One of wintertime training’s major drawbacks is that it leaves you much more injury-prone than in warmer conditions. Tight muscles coupled with icy roads are a dangerous combination. So, to combat this, you need to rev-up your body temperature and loosen up before you start training with any intensity. Use dynamic stretches, such as twisting lunges, knee-to-chest movements, high kicks, and jump squats, to activate your muscles and to elevate your heart rate beforehand. Doing things outdoors is supposed to be fun, right? So what if it’s 20 degrees? Get out there and be creative! The wintertime offers exercise opportunities that just aren’t there any other time of the year because of—you guessed it—snow. So, use it to your advantage. 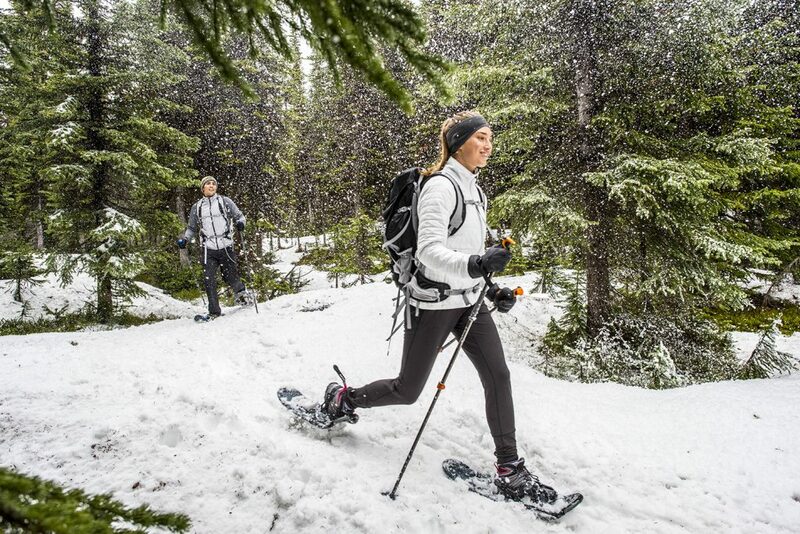 Snowshoeing and cross-country skiing are both excellent cardio workouts that’ll test your lungs and your legs. Ice skating, downhill skiing, and snowboarding will, too, if you’re willing to push yourself. And, of course, there’s still running. 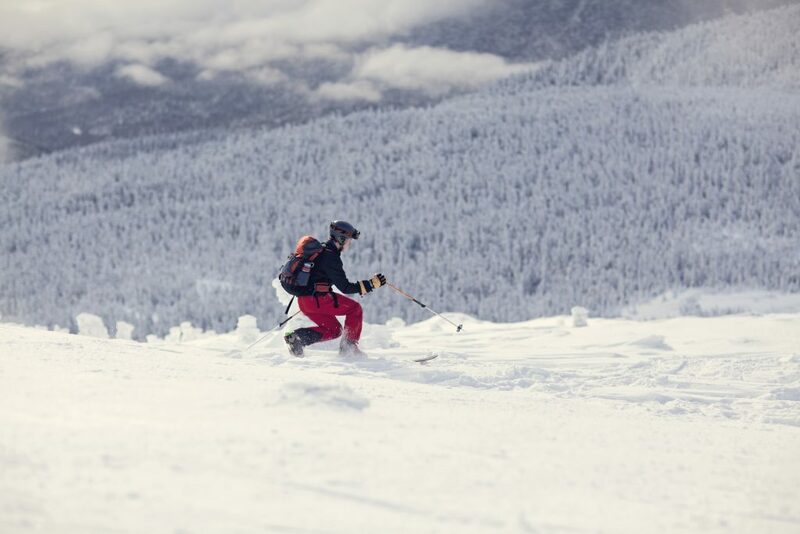 Winter also offers a chance to try a new sport. As one approach, sign up for an ice climbing, mountaineering, or another class at an Eastern Mountain Sports School. If you’re properly bundled up, you’re going to sweat. So, it’s important to hydrate before, during, and after your workout. Heat up a little water before you go, and take it with you in a bottle. Then, after training, use static stretching to keep your muscles loose as you transfer from the cold to the warmth inside. 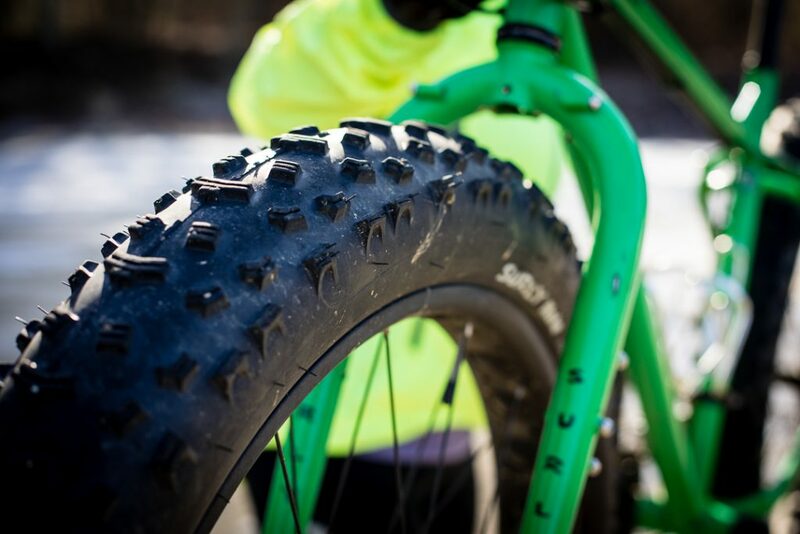 Do you have any favorite winter workouts? Petzl Reactik+: The Most Versatile Headlamp Ever Made? You’re not supposed to try new gear on race day. That’s what your training runs are for. 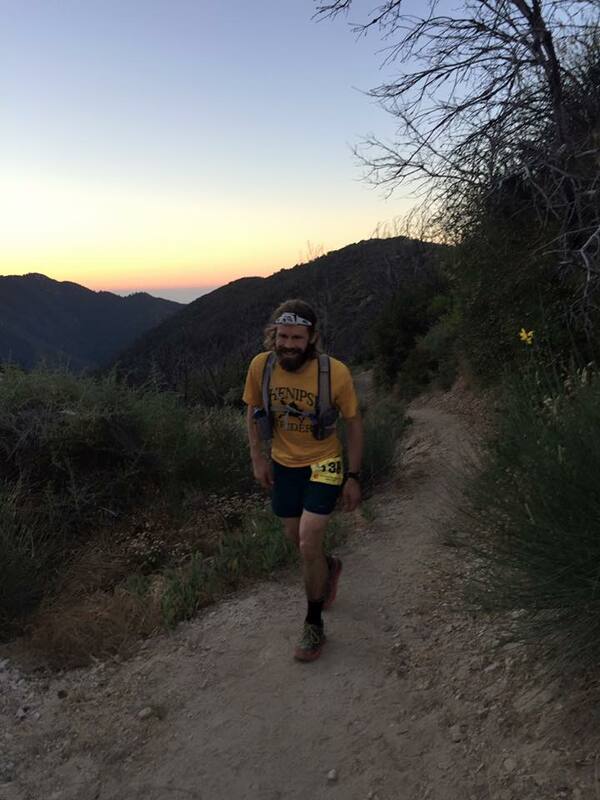 But, when I got the opportunity to test out Petzl’s new Reactik+ Headlamp at the Angeles Crest 100-Mile Endurance Run, I couldn’t pass it up, especially since I hadn’t found a lamp yet that really delivered what I wanted. Other lamps were either uncomfortable or not powerful enough, or had poor battery life, poor light quality, frustrating functionality, or some combination of these. But, now that I had this one, I was facing two big potential problems. I got the lamp just before catching a flight to California and was way too busy to deep-dive into the programming features it claimed to support. I was going to have to trust in the factory settings. On top of that, the lamp comes with a single rechargeable battery. I didn’t have time to order a backup, or the adapter kit that lets you run the lamp on AAA batteries. I was going to get one charge and that was it. No way could I make it through an entire night of running on a single charge—at least, not at a reasonable output. Right? So, there I am, 12:30 AM at Chantry Flats Aid Station, mile 77.1. This is the last access point for my crew; do I ask for my spare headlamp? My next opportunity to swap lights is a drop bag 9.2 miles away…with a 2,500-foot climb in the middle. Oh, and my stomach is full-on rebelling. Will it take me three hours? If the wheels really start falling off, maybe four? I might be asking my lamp to give me seven hours or more of runtime at a fairly powerful output. Past experience has made me weary of relying on any lamp at that output in excess of four hours on a single charge or set of batteries. Seems like the smart thing to do would be to swap out the lamp now. Then again, if I were smart, I probably wouldn’t be running 100 miles in the mountains for fun. 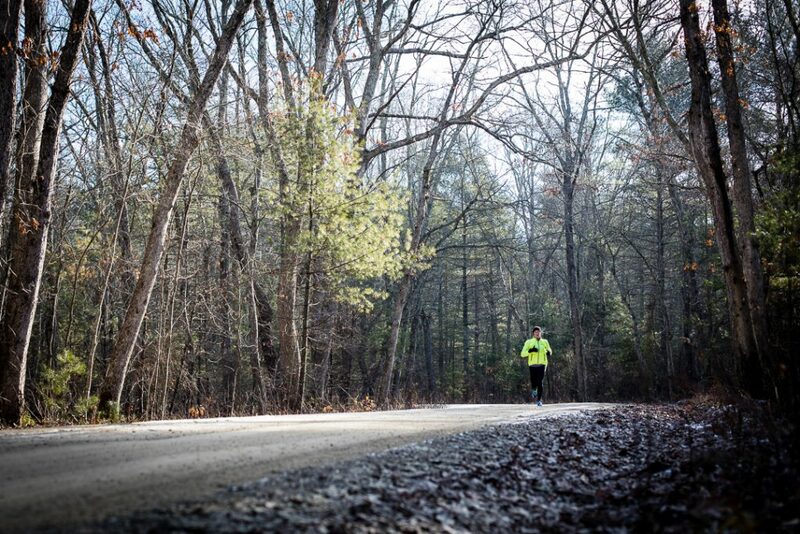 The author putting the Reactik+ to the test during a 100 mile run. And, I’m really liking this lamp so far. It was obviously made with ultra-marathoners and other endurance athletes in mind. The headband is the most comfortable I’ve ever worn. Along the front, just behind the lamp, the fabric is a soft, lightly cushioned, sweat-wicking material, like a tennis sweatband from the 1980s. Then, along the back, the single elastic band meets dual plastic hubs, where it splits up into two thinner bands that wrap around the back of the skull and equalize pressure. The result is a comfortable fit that stays put through dynamic activity without the need for an additional top strap. Simple, but genius! The light quality is top notch, too. A lot of lamps, especially bright ones, produce intense “hotspots,” where light gets concentrated in a small area, while what’s surrounding is much dimmer. The Reactik+ offers crystal clear quality that diffuses outward nicely. Then, there’s the elephant in the room: Petzl’s much-vaunted Reactive Lighting Technology. The claim is that sensors in the lamp can measure the amount of light reflected back from surfaces and will adjust the output accordingly. So, if you’re running down a trail and then want to check out a map, the light will automatically dim to a more comfortable output. I’ll be honest: I was super skeptical. It sounded like the kind of thing that would be very hard to get right, and end up becoming annoying or distracting if it wasn’t perfect. But, consider my mind blown: It works great, and it is just subtle enough that you have to be looking for the auto-adjustments to even notice them. It turns out that this technology is also a game-changer when it comes to battery life. What I didn’t realize during my race was that every time I had my head down on the trail in front of me (which was most of the time), I was actually saving a ton of battery power. I had the lamp on its medium factory setting with a max output of 170 lumens for five hours. But, most of the time, I was running the lamp on nowhere near 170 lumens! And, I always had just the right amount of light. When I picked my head up and looked down the trail, I could see plenty far while barely registering the variations in output. That stretch from Chantry Flats to Idlehour Trail Aid Station was my lowest point in the race. My stomach refused to cooperate with my calorie needs. I was moving OK on the downhills, but every climb felt like I was crawling closer and closer to my own death. My watch battery died somewhere in there, but my pacer showed me her data, including an eye-popping 30-minute mile. I made it to Idlehour at 4:04 AM. Thankfully, my stomach was starting to settle, and my energy level felt surprisingly robust. Even more surprising, my lamp was still going strong! I thought about grabbing the spare from my drop bag, but now, I was straight-up curious. Would this thing last ALL night? I only needed a couple more hours…and, last it did. It was a glorious dawn as I descended out of the Angeles National Forest toward the finish line in Altadena, CA: 100 miles in 27 hours and 40 minutes. One month later, I’m planning a backpacking trip to Glacier National Park. This time, I actually get to play with the programming of this crazy lamp. The Reactik+ comes with Bluetooth® technology, and Petzl has a mobile app called MyPetzl-Light. You can choose from a number of preset activity profiles, including mountaineering, trail running, and trekking, among others, or create your own customized one. It’s a great tool, allowing you to preset target output or battery life for three Reactive Lighting settings and three Constant Lighting settings. As I planned my trip, I thought about all the scenarios under which I might need lighting and for how long, and I used that set to cover all of my bases. You can even use your phone on the fly to check on estimated battery life or set new profiles. What I really want to do next is test out the lamp on night climbs. The last time I went to a crag at night, I distinctly remember being blinded by light reflecting off the rock six inches in front of my face but wanting the powerful output for route finding and making out details in the rock above me. Is the Reactik+ the perfect lighting solution for the nighttime climber? I’m thinking yes. It’s the beginning of fall now. Shorter days are here, which means more time playing around at night in the wilderness. Thankfully, I’ve found the perfect light for just about any activity. Powerful? Check. Comfortable? Check. Customizable? Check. Rechargeable and long-lasting battery? Double-check. Intelligent lighting system that automatically adjusts output based on your needs? Who even thought that could be a thing? I guess Petzl did, and cheers to them. 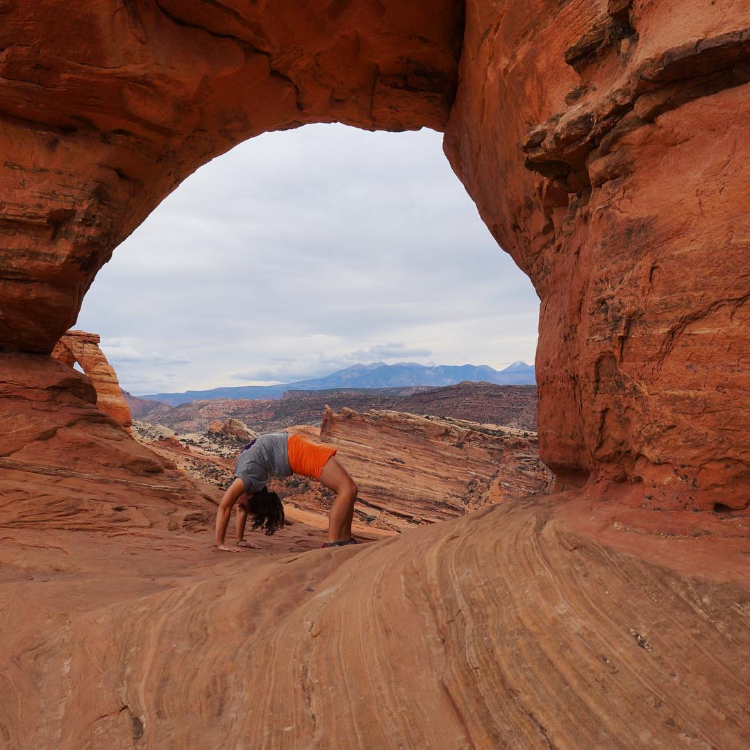 Hiking, backpacking, and most other outdoor activities aren’t usually competitive, but for those looking to get their athletic juices flowing, there is another option that encompasses all of these passions with the spirit of sport. Adventure racing came to the United States from New Zealand in the 1980s. 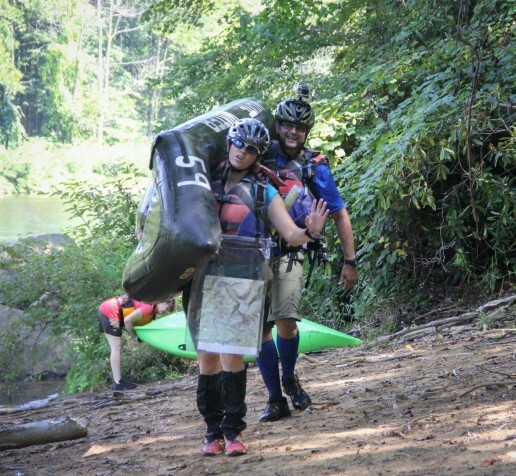 It’s a competitive endurance sport encompassing three legs on an unmarked course: paddling, mountain biking, and trekking. Participants may race solo or with a team consisting of two to four people. Race lengths vary from as little as three short hours to as long as three sleep-depriving weeks. You not only need stamina but also wit and ingenuity. As you race, orienteering checkpoints are scattered across miles upon miles of woodlands, waterways, deserts, or valleys. Your body and mind are tested as you ascend and descend mountains. Your spirit and emotions are pushed to the limit as you search for balance between the decisions you may think are right, and those your team may feel are the best. It is the experience of a lifetime, and not one you will soon forget. So, now that you are committed, what do you bring? If you are even the slightest of an outdoors person, you may have some equipment hiding in the back of your closet, basement, or attic. However, there are six essentials every adventure racer should have. This is by far the most essential piece of equipment. It doesn’t just point north. When combined with a map, the compass can be used to triangulate your position, give the distance to your next checkpoint, and guide you past some nasty obstacles. If you are just starting out, the Suunto A-10 is a very fairly priced compass and completely reliable. I have used it now for the last half-dozen races, and it has not let me down. Most of all, it’s dependable, which is extremely important if you are navigating more than 50 miles in a single race. The most important thing to consider when shopping for a backpack is comfort. You don’t want it to fit incorrectly and leave you with sore shoulders or an aching back. To ensure this, I recommend that you visit the store when shopping to get fitted correctly. EMS was kind enough to not only fit me, but to also have me put my stuff in it and walk around. Additionally, when you pick through the assortment of bags, consider the length of your race, the gear you will haul, and the ease of accessibility to things like water and food. No one likes a hangry adventure racer. I know this from experience. 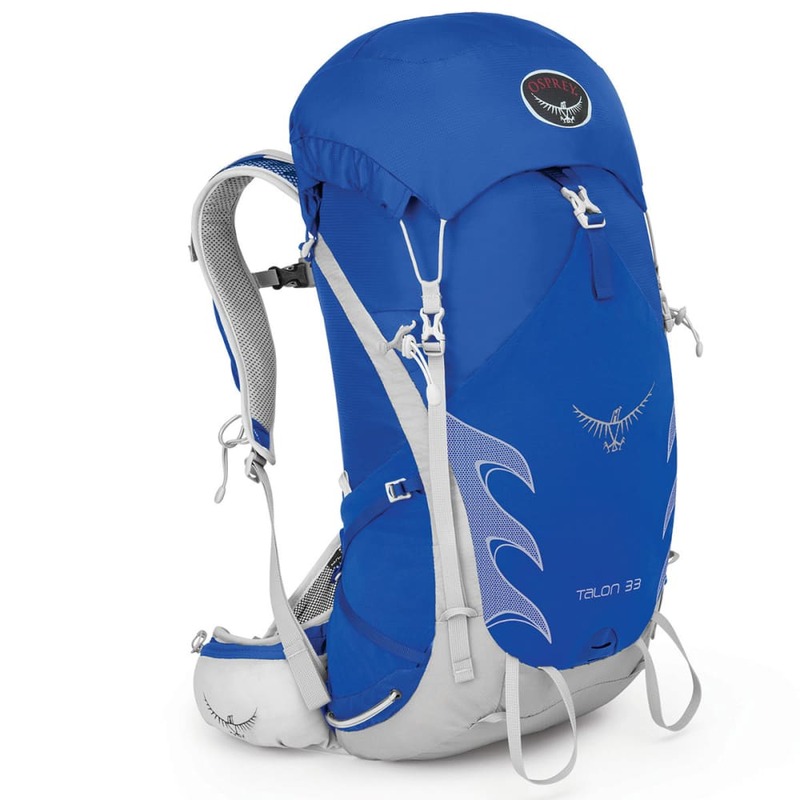 For me, the Osprey Talon 33 is lightweight, extremely comfortable, and versatile and has all the pockets and straps you could need. Not to mention, it comes with a great lifetime warranty and fantastic Osprey customer service attached to it. I bought it solely for a 24-hour race, but even for this trip, it was far too large. Keep in mind that some races have minimum backpack sizes, and it usually has to be able to carry a minimum of 1.5 liters of water. In time, you will see how little you need, or want, to carry. 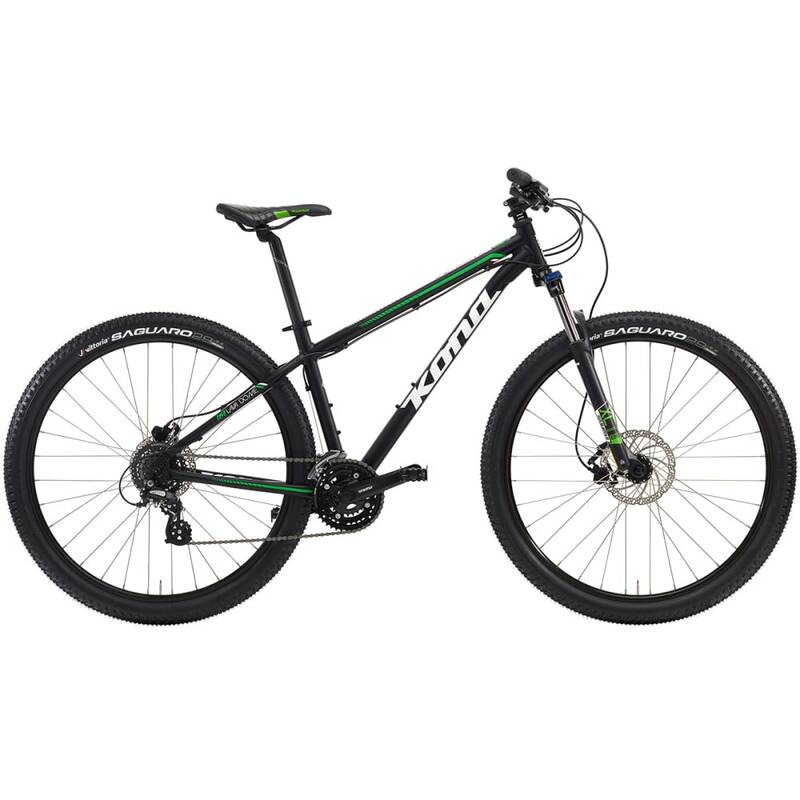 Although some races provide some of the major items like kayaks and ropes for rappelling, bikes are typically BYO. These are another expensive item, for sure, but you won’t want to skimp for the sake of comfort. Like when you purchased a pack, make sure you buy the right size and get fitted for it. You’ll be amazed at the difference in your mental attitude when your equipment suits your own personal needs. When shopping for a bike, consider conditions. So you’re prepared for the rough roads ahead, spend an extra couple bucks to get disc brakes, slightly bigger tires, and a lighter frame. You may have to drag this thing through the woods or rocket down a mountain, so make it easier on yourself. Take care of your feet! You will run through mud, grassy fields, sand, and water, all of which can give your feet a good beating. When you’re shopping, consider waterproof or at least water-resistant trail sneakers. 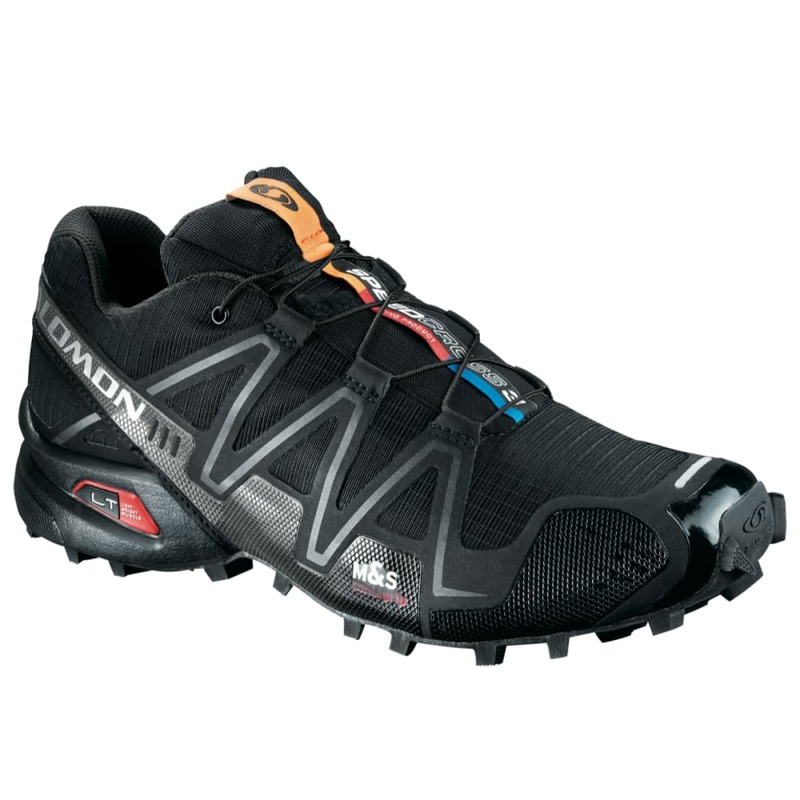 You want flexibility in your ankles for running and biking but a stiff enough shoe to handle bumping into hidden logs and rocks. You’ll also want to consider the laces. My biggest irritant by far has been tying and retying my sneakers while bushwhacking. Do yourself a favor: Get a good shoe with quick laces. You’ll thank me later. You are going to get wet. 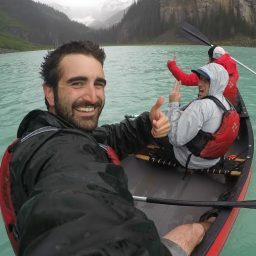 You will either be saturated from your own sweat or from the water during the paddling section, so make sure you wear light clothing that will dry quickly. Nothing is worse than doing an autumn race and going from the paddle to the biking leg with a soaking wet cotton T-shirt. To be prepared, pick your fabrics based on how hot you will be pushing your limits, not how cold you will be standing still. Accidents happen. One minute, you are chatting with your teammates as you bushwhack down a mountain, and the next moment, you hear a groan and several profane but justified words echo down the mountainside. Your teammate just sprained his ankle. 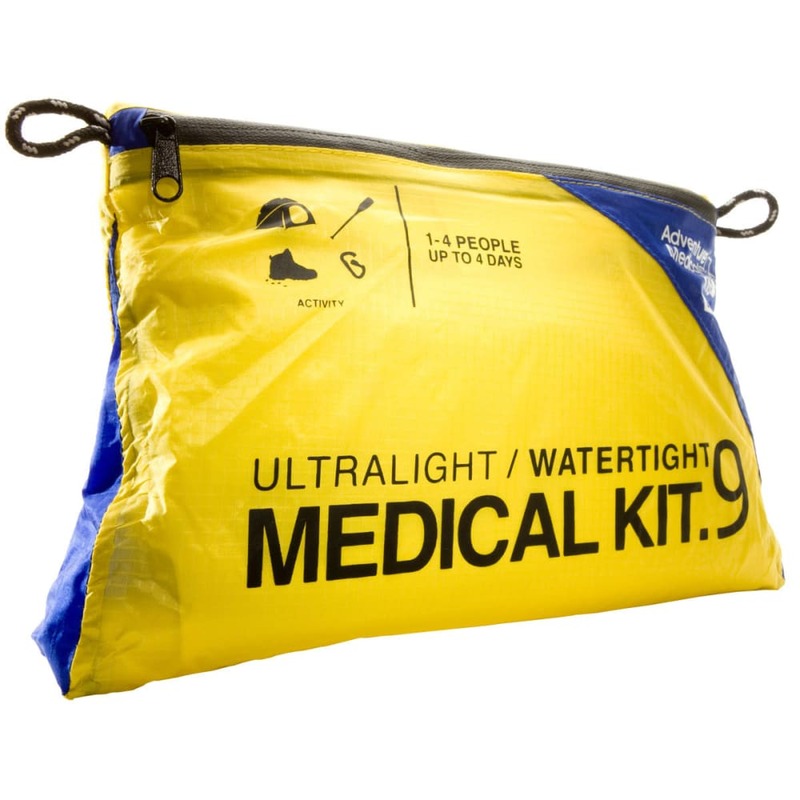 All adventure races require you or your team to carry a first aid kit. Usually, it needs to have the basics: bandages, gauze, and alcohol wipes. Luckily for you, specific kits are out there for adventurous people such as ourselves. No need to dig to the bottom of that bathroom drawer for an ace bandage you swore you still had. Instead, save yourself some time, and just update your supplies. If you do already have a kit, make sure to check all of your medications for expiration dates. At some point on Wednesday, June 26th, I regain enough awareness to recognize I am in a hospital bed, talking to a woman with long brown hair. But, her face is strangely elongated—elongated in a Hollywood scary movie kind of way and shaped like an inverted pear. Whatever. She tells me I am in the Special Care Unit (SCU) of Maine Medical Center in Portland, Maine. I ask her if I have been given narcotics, and the answer is yes. That explains some of my confusion. I ask for her name, and the answer is Kathy. I say, “That’s spooky. My wife’s name is Kathy.” She laughs. I pass out. 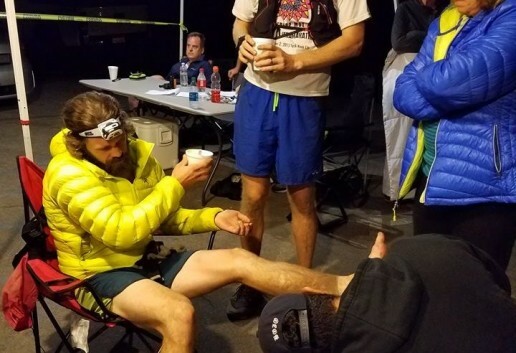 During my fleeting but slowly lengthening moments of lucidity, the SCU nurse in charge of my care helps Kathy explain that after completing the 23-mile Presidential Traverse run across the White Mountains, I was taken to the hospital. I had become combative, and my friends drove me to the ER. I am immediately very embarrassed. Did I do something mean? Did I hurt anybody? They tell me, “No, it was nothing like that.” Then, they say something about an infection, tests, and not knowing exactly what happened. Thus begin my questions. Do I know my name? Yes. Do I know where I am? Yes, Maine Med in Portland, Maine, as she just told me. Where do I live? “Portland” draws a wrinkled brow, since I’m in Portland, Maine, but live in Portland, Connecticut. It’s hard for me to explain, but fortunately they’re not high on narcotics and quickly grasp the coincidence. Do I know what year it is? I look at the wall calendar. 2016. Do I know what day it is? Next to the calendar is a whiteboard on which the team has written the day and date. I read it aloud. Do I know why I’m here? Not really. Some kind of combativeness infection or something. Do I have any bug bites? Did I eat anything unusual recently? Have I had any rashes? Spider bites? International travel to Ebola or Zika territory? Ticks? Illness of any type? Cuts or surgeries? Prescription drugs? Alcohol? Non-prescription drugs? I answer these questions multiple times to different people. The answer is always “No” to everything, except for the two Advil halfway through the run. I had also experienced an electrolyte imbalance and dehydration, which some of my charts noted as severe. My treatment was a careful elevation of the blood sodium level, along with a complex dose of antivirals, antibacterials, and sedatives to keep me calm while my brain recovered, until I could come out of sedation without getting agitated—basically, a mini chemo treatment plus narcotics. Wednesday night, I am stable enough to transfer from SCU to a room on the sixth floor. By then, I also determine that the face of the nice, brown-haired lady named Kathy has returned to normal. And, oh, by the way, she is actually my wife. On a side note, I am never going to live that one down: Even my 12-year-old pulls it out for laughs once in a while. Thursday, I spend a good chunk napping between checks of my vital signs, heparin shots in the belly (the worst, as they feel like stings from an angry hornet), IV changes, and blood samples. My doctors come through periodically, still frustrated and mystified that they cannot determine what happened, and seemingly amazed by my rapid recovery. They even bring in the current batch of students to check out my curious case, all eager, fascinated, and amazed that someone would run so far in the mountains and find themselves inexplicably hospitalized. Kathy tells me this isn’t their first visit, and that, while I was sedated down in SCU, one of them had asked the chief resident leading them, “Look at his legs by the knees – what’s wrong with them?” The resident responded with, “Those are his muscles. We don’t often get people this fit in SCU.” I feel sympathy for zoo animals. Thursday also includes appointments with other professionals: therapists of the physical and occupational persuasions. The physical therapist is Germanic, abrupt, and strong. She tells me we’re taking a walk, and off we go to do a fourteenth of a mile circuit around the unit. It’s tricky: She keeps a firm grip on my arm as I reacquaint myself with being upright and moving. I feel challenged and disoriented, but she reports nothing unusual, given my experience. The occupational therapist, on the other hand, puts me through some enlightening paces. While I know who and where I am and what day it is, I cannot write my name. I know the letters but cannot command my hand to operate the pen properly. Uh-oh. We do some other exercises, one of which tests my word recall. I have two minutes to state as many words as possible that begin with the letter “F.” I struggle to say a few, coming up with “figment” and “fragment” and a couple others. Then, I say, “philanthropist.” The OT looks askance at Kathy, and they both roll their eyes. Yep, the brain’s still broken. Later in the day, I meet with her again and show a bit of progress and, then Friday morning, realize more progress. By then, I can write my name almost normally, and I recognize patterns in words and pictures and can perform calculations and brainstorming operations with more efficiency and accuracy. I’m even reading a novel about Lance Armstrong from the wing’s lending library. Then, a speech therapist checks me out and, after another battery of tests, deems me on the road to recovery. They all tell me to take it easy and be patient, as it’s unclear exactly how much I will recover over time, even though in just a few days I’ve made significant strides. I get one more test before the doctors agree to discharge me: an ultrasound of my abdomen, to investigate the source of pain in the upper right quadrant. I am frustrated by the delay: I want out of this joint. But, I stick it out. The test reveals a minor irritation with the wall of my gallbladder. I ask myself, “Do we still even use our gallbladder?” The doctor says it should resolve itself over time. Late Friday afternoon, I am discharged, with paperwork stating my intake reason was sudden onset confusion and the blood and cerebrospinal fluid tests performed indicated no infectious causes. Instead, I had an electrolyte disturbance known as hyponatremia that resulted from severe dehydration related to my hiking activities. To follow up, I have an appointment set with my primary care physician and a prescription for blood work. Finally, I get to head home, and Kathy and I thank the staff on our way out. Over the ensuing weeks, I seek explanations. I ask Mark, Sean, and Nat, my partners on the run, and Kathy what happened, and request copies of my charts from both hospitals. Then, I work on rebuilding the narrative, to assemble in my own mind a clear understanding. My brain injury hinders my effort, as I have to reprocess things multiple times before they sink in. Here’s what I learn about how events unfolded. After running and hiking 20-or-so miles, my feet fell asleep but reawakened after I removed the compression calf sleeves, and I vomited all the water and food that was in my gut. I walked with Mark back to Mizpah Spring Hut, where we met up with Nat and Sean. We refilled our water for the last time, had some snacks, and collected ourselves. I snuck off the trail to vomit again, and then, we ran the three miles down to the car. I had regained my bearings enough to cruise that section, in fact running at a pace too quick for Mark’s comfort, as he was fatigued. Near the parking lot is a small dunking pool, and the guys cooled off there, effectively icing their calf and thigh muscles in the mountain stream. While the guys splashed in the pool, I sat quietly by the side and ambled away to vomit one last time. By this point, I was still coherent but quiet, giving the impression I was just bonking pretty hard, or having very low energy due to the day’s intense activity. When we got to the car, I laid down exhausted on the pavement. After a bit, the guys encouraged me into the passenger seat and headed for the nearest convenience store, thinking some Coke and potato chips would introduce the sugar and salt my body needed to generate some more energy. When, after a few minutes, I grabbed the steering wheel and mumbled incoherently, they realized I needed more than junk food. From there, they took me to the hospital in North Conway, arriving at 8 p.m. But, as I didn’t want to get out of the car and was not communicating verbally, it took four people to get me into a wheelchair. Once in the ER, I was still agitated, uncommunicative, and resistant to the care they tried to administer with IVs and other equipment. The staff determined for my safety and theirs that restraints and sedation were needed. They also gave me three liters of normal saline in one-liter boluses over three hours. Every time the sedation started to wear off, I fought the restraints and tried to remove the IVs and electrodes. When Mark explained this to me, he said, “It was clear you did not understand what was going on, and you were fighting for your life.” The hospital staff realized I needed a higher level of care than they could provide, and at 1:00 a.m., they transferred me to Maine Medical Center via ambulance. At Maine Med, I continued to receive excellent care. The Special Care Unit doctors were convinced, based on their experience and research, that my behavior indicated a viral infection, but tests failed to pinpoint a known virus. So, as they treated me for low blood sodium, they also gave me the shotgun doses of antivirals and antibacterials to treat all kinds of nasty stuff. After my discharge and a couple days of recovery at home, I research hyponatremia in endurance athletes. I learn that this condition is almost always a result of water intoxication, or over-hydration. So, thinking back, I carefully review how much water I consumed, confirm I kept at or below my target rate of 20 to 25 ounces per hour, and do not believe I over-hydrated myself during the run. I conclude I was probably mildly to moderately dehydrated, the opposite of over-hydrated. More confusion. Unlike on past runs, I did not take electrolyte supplements or drinks, because I knew the food we made contained much of what the supplements provide. I wonder if not taking them caused my sodium level to get too low. Normal blood sodium levels are between 133 and 145 mEq/L, and my first test done in Maine Med at 6 a.m. on Sunday showed a level of 126, which then dropped to 124 by 8 a.m. My research also reveals that a coma commonly occurs at 120. The gratitude I have for my running partners increases exponentially, as I realize they saved my life by getting me to the hospital when they did. Unsatisfied with my diagnoses from the hospital, I wonder if talking with someone experienced in helping endurance athletes is an option. Internet searches for experts in Connecticut yield one really good candidate: a UConn professor who runs the Human Performance Laboratory and has published scholarly studies on hyponatremia, dehydration among soldiers, and more subjects. I email him, asking if he’d be willing to review and discuss my experience. I also try a sports medicine doctor, but his specialty lies in things like twisted ankles and rotator cuff tears. After two weeks of obsessive research and questioning, I get lucky and receive an email from the UConn guy. He is willing to review my case and share his insights! The professor organizes a conference call that includes him, me, and two of his colleagues who are experts in human hydration and exertional heat exhaustion. They ask for even more details than I have, like urine output and sweat rate – gross. But, that, plus the information from the other doctors, is what it takes to understand the situation and the likelihood of it happening again. After a couple calls, I develop the final picture of what occurred. A virus infected my gut, compromising my body’s ability to process the food and water I consumed on the run. After 20 miles, when my gut started signaling that it needed to be emptied, my brain shunted the blood flow away from my extremities to protect my core, causing my feet to fall asleep. Then, I vomited. Because I did not absorb any nutrients, including sodium, from the food, and as I had run 20 miles on a beautiful, sweaty day in the mountains, my blood sodium level dropped. The lack of sodium changed the chemistry within my cells, compromising my brain’s signals, and also increased the volume of intracellular fluid, causing my brain to swell and pressure to build up in the skull, resulting in cerebral edema. The electrolyte imbalance then injured my kidneys and liver. The antivirals and antibacterials were so strong they may have also compromised my organs a bit. Because the virus was unidentifiable, however, it is highly unlikely to happen again. Exercise-associated hyponatremia (EAH) is a complicated condition which is difficult to diagnose or treat, and even experts like the folks at the UConn Human Performance Lab need to conduct further research on some of the contributing factors. It’s also not widely encountered or understood within the traditional medical community. After all, how many folks run super long distances or difficult terrain for entire days and then go to the ER? Among those who do, their individual factors vary widely, presenting opportunity for conflict and controversy. Diagnosis is then compounded by a delayed onset of symptoms in many cases. Treatment depends on whether the patient’s total fluid volume is too high or low and whether their symptoms are mild or severe. My encephalopathy and measured sodium levels placed me squarely in the severe category. Recommended treatment of severe EAH with encephalopathy (EAHE) is a 100mL bolus of three-percent saline, possibly repeated until improvement is shown. But in a typical ER, this is a very risky treatment, so, unless the staff is familiar with the nuances of accurately diagnosing and treating severe EAH, it’s unlikely to be used. Normal saline is not recommended for severe AEHE in folks with high-fluid volumes, as it does not increase blood sodium fast enough relative to the volume. Mild EAH, on the other hand, can be treated by simply drinking four bouillon cubes in a half cup of water! I don’t know if I had high- or low-fluid volume. Whether or not I received the perfect treatment protocol is irrelevant to me. My friends, the hospital, and ambulance teams kept me alive, and thanks to them, I get to continue being a husband, father, worker, and mountain runner. Regardless of the etiology and symptomatology of EAH, if I am going to keep doing things like run the Presidential Range, I need to prevent it. The primary cause of EAH is over-hydration; prevention involves drinking to thirst, instead of following some arcane rule, like “more is better.” I have measured my sweat rate by weighing myself before and after an hour-long run, during which I drank nothing. That weight difference, in ounces or milliliters, is how much fluid I need to replace per hour on long runs – nothing more. If it’s particularly hot, I can increase it a little, but still only drink to thirst. The jury’s still out on whether electrolyte supplements curb the risk of EAH, but taking them has never hurt me in the past, so I will continue using them. Three months after that fateful Presidential Traverse, I am back to my normal summer and fall level of mountain biking and trail running, and working. I still have some short-term memory and word recall issues, but honestly, that may be just old age. 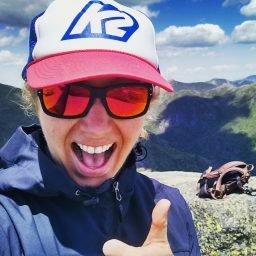 On October 7th, three days after I submitted this article, I started the longest race I have ever attempted, one which has a 48-hour cutoff time and a whole lot of climbing in Washington’s North Cascades Mountains. When this article was published, I had not yet returned from the race. But, I went into it knowing I never train well, and as this summer’s training blew up in June, I knew I had little chance of completing the course. I started because I can, because I have a running partner who has agreed to stay with me, and because I love being in the hills with friends. 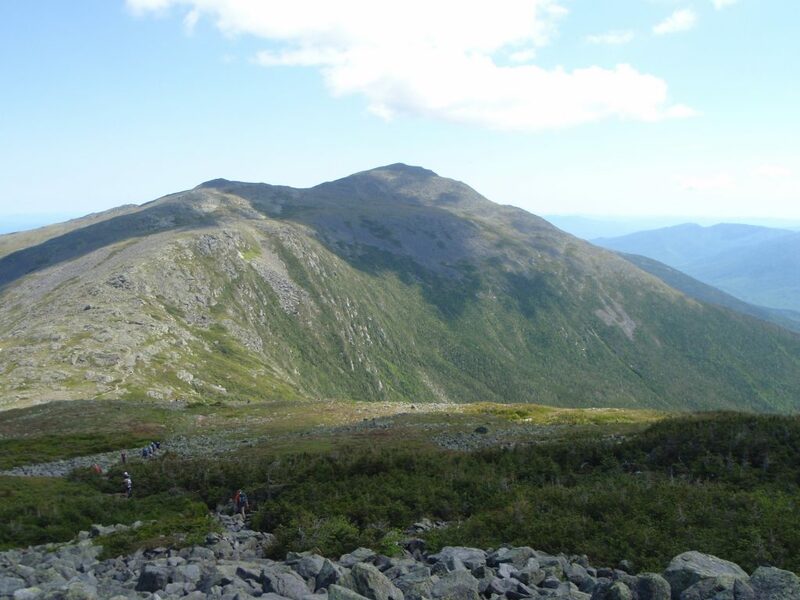 And, I can’t wait to go back for another run across the Presidentials next summer! In fact, my water bottle collection sprawls from my refrigerator (where I always have a few cold ones on standby) to a water bottle drawer in my pantry to my desk at work. They are of various shapes and sizes, and made of a variety of materials. And almost every single one of them has a distinct purpose. So if you find yourself a little overwhelmed by the number of bottle options presented to you, either in our stores or on ems.com, here are some examples of which type of water bottle I like best for each activity. …I prefer either a classic Nalgene or a Hydro Flask bottle. Nalgene bottles are great not only because they come in a bunch of different sizes, shapes, and colors, but also because they’re virtually indestructible, so I know that if I accidentally drop my bottle at the crag it’ll stay intact. The one drawback to a Nalgene, however, is that it won’t exactly keep your water cold. So if I know the weather is going to be particularly hot, I’ll opt for a Hydro Flask bottle instead. Thanks to their double-wall construction, these bad boys keep water cold for 24 hours and they’re available in sizes from 18 oz all the way up to 64oz. If you’re in the anti-plastic bottle camp, Hydro Flasks are an especially great choice for you, since they’re made of stainless steel. This also makes them more durable. 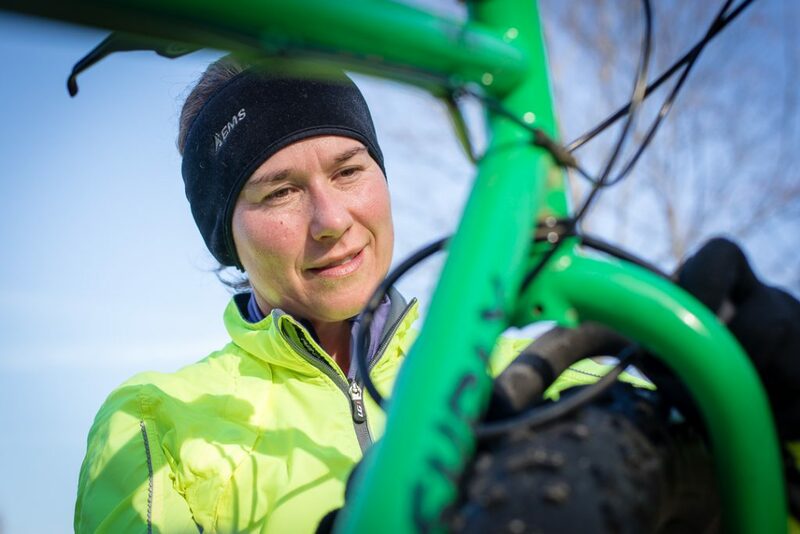 An added benefit of bike bottles is that they are convenient in many other areas, too—since they’re made to fit in narrow bottle cages, they tend to also fit really well in car cup holders and the molded-in drink holders in most kayaks. The “jet valve” in CamelBak bottles makes it easy for you to drink while you’re riding–just squeeze the bottle and keep on chugging. PRO TIP: If you like your water as cold as possible, fill your CamelBak Podium Chill halfway with ice cubes and then put the bottle in your freezer the night before your ride. The next day, top the bottle off with water and and it will stay cold for hours. …it’s usually between a Nalgene bottle and a hydration pack for me. But these collapsible bottles are also a great option, especially if you’re really into saving weight and space in your pack. …a bottle with a straw is the best. Yoga classes that make you thirsty also tend to be fairly fast-paced, so you don’t want to have to waste time unscrewing the cap on your bottle just to take a sip. 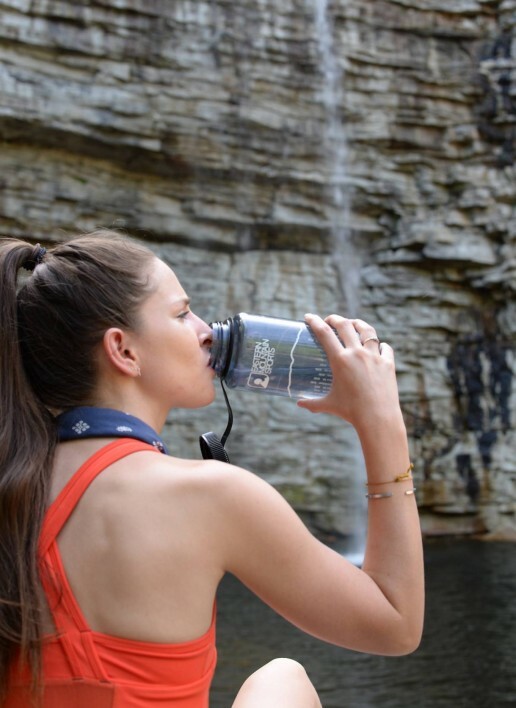 With a bottle like the Camelbak Eddy, it’s so quick and easy to grab a quick gulp that you can do it without even coming out of down dog if you want. Bottles with straws are also great for everyday use, especially if you’re the type of person who tends to end up wearing more water than you actually drink with a regular bottle. So there you have it, my personal guide to staying hydrated during your favorite outdoor activity. No matter which bottle you choose, just be sure to fill it, drain it and repeat OFTEN–especially during the summer. Do you have a water bottle that’s worked well for your over the years? Leave a comment or share a photo on the Eastern Mountain Sports Facebook page!